WASHINGTON (Reuters) - U.S. President Donald Trump on Wednesday held steady in his refusal to publicly release his tax returns, despite mounting pressure in Congress that is likely to spur a legal battle for the documents to be disclosed. Last week, the Democratic head of a powerful U.S. House committee asked the IRS for six years of Trump's personal and business tax returns, a long-awaited request that was expected to lead to a lengthy court battle. 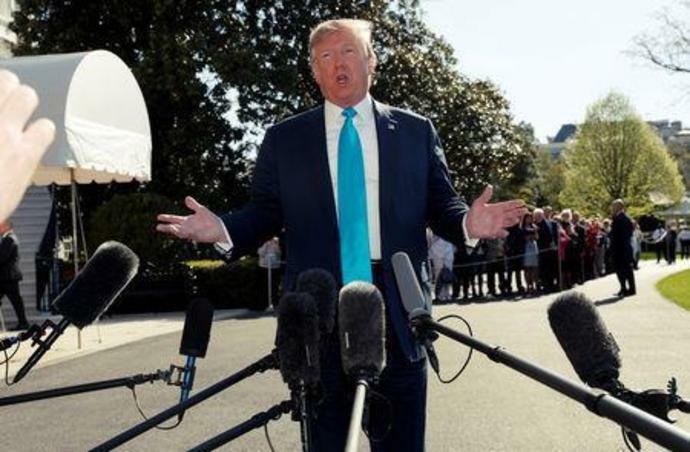 Democrats say the request to see Trump's tax documents is grounded in law and is needed, citing Trump's refusal to disclose his tax records or to recuse himself from his business interests. The latter include golf courses, hotels and other properties which raise questions about the potential for conflicts of interest. Congressional Republicans oppose the effort, saying it would set a dangerous precedent by politicizing the confidential tax documents of a U.S. citizen. Legal experts have said that little case law would be available to guide judges if Congress were to take the administration to court over Trump's taxes.